In Defense of Communism: Vladimir Ilyich Lenin- The State and Revolution (1917) Part III "Experience of the Paris Commune of 1871: Marx's Analysis"
Vladimir Ilyich Lenin- The State and Revolution (1917) Part III "Experience of the Paris Commune of 1871: Marx's Analysis"
III. EXPERIENCE OF THE PARIS COMMUNE OF 1871: MARX'S ANALYSIS. 1. What Made the Communards' Attempt Heroic? The only “correction” Marx thought it necessary to make to the Communist Manifesto he made on the basis of the revolutionary experience of the Paris Commune. "... One thing especially was proved by the Commune, viz., that 'the working class cannot simply lay hold of the ready-made state machinery and wield it for its own purposes'...."
The authors took the words that are in single quotation marks in this passage from Marx's book, The Civil War in France. 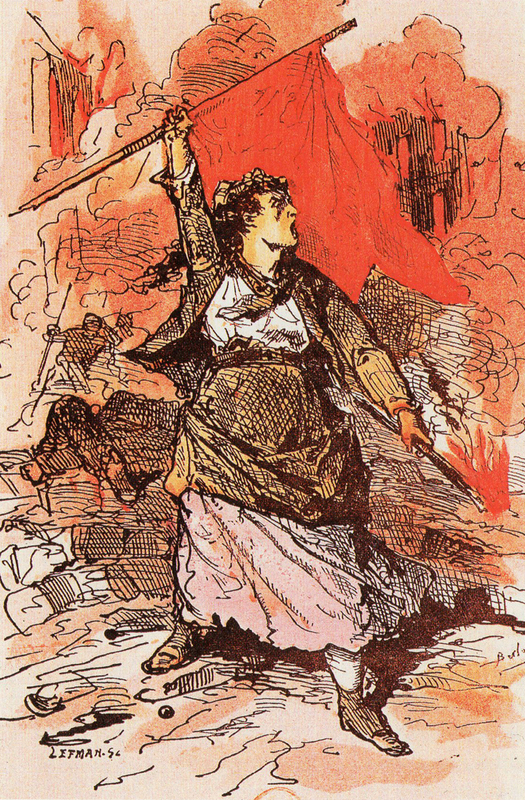 Thus, Marx and Engels regarded one principal and fundamental lesson of the Paris Commune as being of such enormous importance that they introduced it as an important correction into the Communist Manifesto. Most characteristically, it is this important correction that has been distorted by the opportunists, and its meaning probably is not known to nine-tenths, if not ninety-nine-hundredths, of the readers of the Communist Manifesto. We shall deal with this distortion more fully farther on, in a chapter devoted specially to distortions. Here it will be sufficient to note that the current, vulgar “interpretation” of Marx's famous statement just quoted is that Marx here allegedly emphasizes the idea of slow development in contradistinction to the seizure of power, and so on. The words, "to smash the bureaucratic-military machine", briefly express the principal lesson of Marxism regarding the tasks of the proletariat during a revolution in relation to the state. And this is the lesson that has been not only completely ignored, but positively distorted by the prevailing, Kautskyite, “interpretation” of Marxism! As for Marx's reference to The Eighteenth Brumaire, we have quoted the relevant passage in full above. It is interesting to note, in particular, two points in the above-quoted argument of Marx. First, he restricts his conclusion to the Continent. This was understandable in 1871, when Britain was still the model of a purely capitalist country, but without a militarist clique and, to a considerable degree, without a bureaucracy. Marx therefore excluded Britain, where a revolution, even a people's revolution, then seemed possible, and indeed was possible, without the precondition of destroying "ready-made state machinery". Today, in 1917, at the time of the first great imperialist war, this restriction made by Marx is no longer valid. Both Britain and America, the biggest and the last representatives — in the whole world — of Anglo-Saxon “liberty”, in the sense that they had no militarist cliques and bureaucracy, have completely sunk into the all-European filthy, bloody morass of bureaucratic-military institutions which subordinate everything to themselves, and suppress everything. Today, in Britain and America, too, "the precondition for every real people's revolution" is the smashing, the destruction of the "ready-made state machinery" (made and brought up to the “European”, general imperialist, perfection in those countries in the years 1914-17). Secondly, particular attention should be paid to Marx's extremely profound remark that the destruction of the bureaucratic-military state machine is "the precondition for every real people's revolution". This idea of a "people's revolution seems strange coming from Marx, so that the Russian Plekhanovites and Mensheviks, those followers of Struve who wish to be regarded as Marxists, might possibly declare such an expression to be a "slip of the pen" on Marx's part. They have reduced Marxism to such a state of wretchedly liberal distortion that nothing exists for them beyond the antithesis between bourgeois revolution and proletarian revolution, and even this antithesis they interpret in an utterly lifeless way. If we take the revolutions of the 20th century as examples we shall, of course, have to admit that the Portuguese and the Turkish revolutions are both bourgeois revolutions. Neither of them, however, is a "people's" revolution, since in neither does the mass of the people, their vast majority, come out actively, independently, with their own economic and political demands to any noticeable degree. By contrast, although the Russian bourgeois revolution of 1905-07 displayed no such “brilliant” successes as at time fell to the Portuguese and Turkish revolutions, it was undoubtedly a "real people's" revolution, since the mass of the people, their majority, the very lowest social groups, crushed by oppression and exploitation, rose independently and stamped on the entire course of the revolution the imprint of their own demands, their attempt to build in their own way a new society in place of the old society that was being destroyed. In Europe, in 1871, the proletariat did not constitute the majority of the people in any country on the Continent. A "people's" revolution, one actually sweeping the majority into its stream, could be such only if it embraced both the proletariat and the peasants. These two classes then constituted the “people”. These two classes are united by the fact that the "bureaucratic-military state machine" oppresses, crushes, exploits them. To smash this machine, to break it up, is truly in the interest of the “people”, of their majority, of the workers and most of the peasants, is "the precondition" for a free alliance of the poor peasant and the proletarians, whereas without such an alliance democracy is unstable and socialist transformation is impossible. As is well known, the Paris Commune was actually working its way toward such an alliance, although it did not reach its goal owing to a number of circumstances, internal and external. Consequently, in speaking of a "real people's revolution", Marx, without in the least discounting the special features of the petty bourgeois (he spoke a great deal about them and often), took strict account of the actual balance of class forces in most of the continental countries of Europe in 1871. On the other hand, he stated that the “smashing” of the state machine was required by the interests of both the workers and the peasants, that it united them, that it placed before them the common task of removing the “parasite” and of replacing it by something new. In this connection, the following measures of the Commune, emphasized by Marx, are particularly noteworthy: the abolition of all representation allowances, and of all monetary privileges to officials, the reduction of the remuneration of all servants of the state to the level of "workmen's wages". This shows more clearly than anything else the turn from bourgeois to proletarian democracy, from the democracy of the oppressors to that of the oppressed classes, from the state as a "special force" for the suppression of a particular class to the suppression of the oppressors by the general force of the majority of the people--the workers and the peasants. And it is on this particularly striking point, perhaps the most important as far as the problem of the state is concerned, that the ideas of Marx have been most completely ignored! In popular commentaries, the number of which is legion, this is not mentioned. The thing done is to keep silent about it as if it were a piece of old-fashioned “naivete”, just as Christians, after their religion had been given the status of state religion, “forgot” the “naivete” of primitive Christianity with its democratic revolutionary spirit. The reduction of the remuneration of high state officials seem “simply” a demand of naive, primitive democracy. One of the “founders” of modern opportunism, the ex-Social-Democrat Eduard Bernstein, has more than once repeated the vulgar bourgeois jeers at “primitive” democracy. Like all opportunists, and like the present Kautskyites, he did not understand at all that, first of all, the transition from capitalism to socialism is impossible without a certain “reversion” to “primitive” democracy (for how else can the majority, and then the whole population without exception, proceed to discharge state functions? ); and that, secondly, "primitive democracy" based on capitalism and capitalist culture is not the same as primitive democracy in prehistoric or precapitalist times. Capitalist culture has created large-scale production, factories, railways, the postal service, telephones, etc., and on this basis the great majority of the functions of the old "state power" have become so simplified and can be reduced to such exceedingly simple operations of registration, filing, and checking that they can be easily performed by every literate person, can quite easily be performed for ordinary "workmen's wages", and that these functions can (and must) be stripped of every shadow of privilege, of every semblance of "official grandeur". The way out of parliamentarism is not, of course, the abolition of representative institutions and the elective principle, but the conversion of the representative institutions from talking shops into “working” bodies. "The Commune was to be a working, not a parliamentary, body, executive and legislative at the same time." "A working, not a parliamentary body"--this is a blow straight from the shoulder at the present-day parliamentarian country, from America to Switzerland, from France to Britain, Norway and so forth--in these countries the real business of “state” is performed behind the scenes and is carried on by the departments, chancelleries, and General Staffs. parliament is given up to talk for the special purpose of fooling the "common people". This is so true that even in the Russian republic, a bourgeois-democratic republic, all these sins of parliamentarism came out at once, even before it managed to set up a real parliament. The heroes of rotten philistinism, such as the skobelevs and tseretelis, the Chernovs and Avksentyevs, have even succeeded in polluting the Soviets after the fashion of the most disgusting bourgeois parliamentarism, in converting them into mere talking shops. In the Soviets, the “socialist” Ministers are fooling the credulous rustics with phrase-mongering and resolutions. In the government itself a sort of permanent shuffle is going on in order that, on the one hand, as many Socialist-Revolutionaries and Mensheviks as possible may in turn get near the “pie”, the lucrative and honorable posts, and that, on the other hand, the “attention” of the people may be “engaged”. meanwhile the chancelleries and army staffs “do” the business of “state”. Dyelo Naroda, the organ of the ruling Socialist-Revolutionary Party, recently admitted in a leading article--with the matchless frankness of people of "good society", in which “all” are engaged in political prostitution - that even in the ministeries headed by the “socialists” (save the mark! ), the whole bureaucratic apparatus is in fact unchanged, is working in the old way and quite “freely” sabotaging revolutionary measures! Even without this admission, does not the actual history of the participation of the Socialist-Revolutionaries and Mensheviks in the government prove this? It is noteworthy, however, that in the ministerial company of the Cadets, the Chernovs, Rusanovs, Zenzinovs, and other editors of Dyelo Naroda have so completely lost all sense of shame as to brazenly assert, as if it were a mere bagetelle, that in “their” ministeries everything is unchanged!! Revolutionary-democratic phrases to gull the rural Simple Simons, and bureaucracy and red tape to "gladden the hearts" of the capitalists--that is the essence of the “honest” coalition. The Commune substitutes for the venal and rotten parliamentarism of bourgeois society institutions in which freedom of opinion and discussion does not degenerate into deception, for the parliamentarians themselves have to work, have to execute their own laws, have themselves to test the results achieved in reality, and to account directly to their constituents. Representative institutions remain, but there is no parliamentarism here as a special system, as the division of labor between the legislative and the executive, as a privileged position for the deputies. We cannot imagine democracy, even proletarian democracy, without representative institutions, but we can and must imagine democracy without parliamentarism, if criticism of bourgeois society is not mere words for us, if the desire to overthrow the rule of the bourgeoisie is our earnest and sincere desire, and not a mere “election” cry for catching workers' votes, as it is with the Mensheviks and Socialist-Revolutionaries, and also the Scheidemanns and Legiens, the Smblats and Vanderveldes. To organize the whole economy on the lines of the postal service so that the technicians, foremen and accountants, as well as all officials, shall receive salaries no higher than "a workman's wage", all under the control and leadership of the armed proletariat--that is our immediate aim. This is what will bring about the abolition of parliamentarism and the preservation of representative institutions. This is what will rid the laboring classes of the bourgeoisie's prostitution of these institutions. "In a brief sketch of national organization which the Commune had no time to develop, it states explicitly that the Commune was to be the political form of even the smallest village...." The communes were to elect the "National Delegation" in Paris. "... The few but important functions which would still remain for a central government were not to to be suppressed, as had been deliberately mis-stated, but were to be transferred to communal, i.e., strictly responsible, officials. "... National unity was not to be broken, but, on the contrary, organized by the communal constitution; it was to become a reality by the destruction of state power which posed as the embodiment of that unity yet wanted to be independent of, and superior to, the nation, on whose body it was but a parasitic excrescence. While the merely repressive organs of the old governmental power were to be amputated, its legitimate functions were to be wrested from an authority claiming the right to stand above society, and restored to the responsible servants of society." To confuse Marx's view on the "destruction of state power, a parasitic excrescence", with Proudhon's federalism is positively monstrous! But it is no accident, for it never occurs to the opportunist that Marx does not speak here at all about federalism as opposed to centralism, but about smashing the old, bourgeois state machine which exists in all bourgeois countries. The only thing that does occur to the opportunist is what he sees around him, in an environment of petty-bourgeois philistinism and “reformists” stagnation, namely, only “municipalities”! The opportunist has even grown out of the habit of thinking about proletarian revolution. It is ridiculous. But the remarkable thing is that nobody argued with Bernstein on this point. Bernstein has been refuted by many, especially by Plekhanov in Russian literature and by Kautsky in European literature, but neither of them has said anything about this distortion of Marx by Bernstein. The opportunist has so much forgotten how to think in a revolutionary way and to dwell on revolution that he attributes “federalism” to Marx, whom he confuses with the founder of anarchism, Proudhon. As for Kautsky and Plekhanov, who claim to be orthodox Marxists and defenders of the theory of revolutionary Marxism, they are silent on this point! Here is one of the roots of the extreme vulgarization of the views on the difference between Marxism and anarchism, which is characteristic of both the Kautskyites and the opportunists, and which we shall discuss again later. There is not a trace of federalism in Marx's above-quoted observation on the experience of the Commune. Marx agreed with Proudhon on the very point that the opportunist Bernstein did not see. Marx disagreed with Proudhon on the very point on which Bernstein found a similarity between them. Marx agreed with Proudhon in that they both stood for the “smashing” of the modern state machine. Neither the opportunists nor the Kautskyites wish to see the similarity of views on this point between Marxism and anarchism (both Proudhon and Bakunin) because this is where they have departed from Marxism. Marx disagreed both with Proudhon and Bakunin precisely on the question of federalism (not to mention the dictatorship of the proletariat). Federalism as a principle follows logically from the petty-bourgeois views of anarchism. Marx was a centralist. There is no departure whatever from centralism in his observations just quoted. Only those who are imbued with the philistine "superstitious belief" in the state can mistake the destruction of the bourgeois state machine for the destruction of centralism! Now if the proletariat and the poor peasants take state power into their own hands, organize themselves quite freely in communes, and unite the action of all the communes in striking at capital, in crushing the resistance of the capitalists, and in transferring the privately-owned railways, factories, land and so on to the entire nation, to the whole of society, won't that be centralism? Won't that be the most consistent democratic centralism and, moreover, proletarian centralism? Bernstein simply cannot conceive of the possibility of voluntary centralism, of the voluntary fusion of the proletarian communes, for the sole purpose of destroying bourgeois rule and the bourgeois state machine. Like all philistines, Bernstein pictures centralism as something which can be imposed and maintained solely from above, and solely by the bureaucracy and military clique. As though foreseeing that his views might be distorted, Marx expressly emphasized that the charge that the Commune had wanted to destroy national unity, to abolish the central authority, was a deliberate fraud. Marx purposely used the words: "National unity was... to be organized", so as to oppose conscious, democratic, proletarian centralism to bourgeois, military, bureaucratic centralism. But there are none so deaf as those who will not hear. And the very thing the opportunists of present-day Social-Democracy do not want to hear about it the destruction of state power, the amputation of the parasitic excrescence.